While Lenovo introduced the most-bestest mobile headset based on Google Daydream, the Mirage Solo. Oculus also made an all-in-one mobile headset, but I’m not a fan – so I’ll be brief. I already went into detail about the different between 3DoF (Three Degrees of Freedom) and 6DoF (Six Degrees of Freedom) in my Lenovo Mirage Solo review, so I won’t go into again here. Read that article if you haven’t, to get up to speed. To be blunt: despite the excellent display, the Oculus Go only has 3DoF so I cannot recommend it and am sorely disappointed. Sure, the display is probably the best VR display I’ve seen. Both the Lenovo Mirage Solo and the Oculus Go have better displays than the HTC Vive or Oculus Rift CV1. But they’re mobile headsets – both only have one hand in VR, and both only have 3DoF for hand controllers. The difference, of course, is that the Lenovo Mirage Solo has 6DoF head tracking. It’s still got a great display, and it’s way more comfortable in VR. 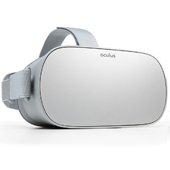 The only advantage of the Oculus Go is that it has built in headphones, where as the Mirage Solo has a headphone port and includes some earbuds with a custom short cable. Not ideal, but the 6DoF on the Solo trumps it’s lack of built in headphones any day. The Oculus go immediately reminded me of the early days of VR, except in better resolution. Even as a VR veteran, the lack of 6DoF started making me sick right away – I’ve become too used to the Rift CV1 and HTC Vive’s full 6DoF. So this mobile offering is disappointing. Like I mentioned in the Lenovo Mirage Solo review, it has full Android customized for VR, so a fully mature mobile OS. It works great. Oculus rolled their own “Operating System,” if it can be called that. It’s more of a walled garden store and app launch pad – not really an OS. It’s implemented well, but it’s obviously not a full OS. So overall, the Oculus Go is a waste of time IMO. Even for people who want a “budget VR” experience. Sure it’s cheaper than the Mirage Solo, and much cheaper that the Oculus CV1 and HTC Vive. But it’s also 3DoF only. So it’s cheaper, and also, makes you want to puke. Spend a little bit more and get the Lenovo – period.